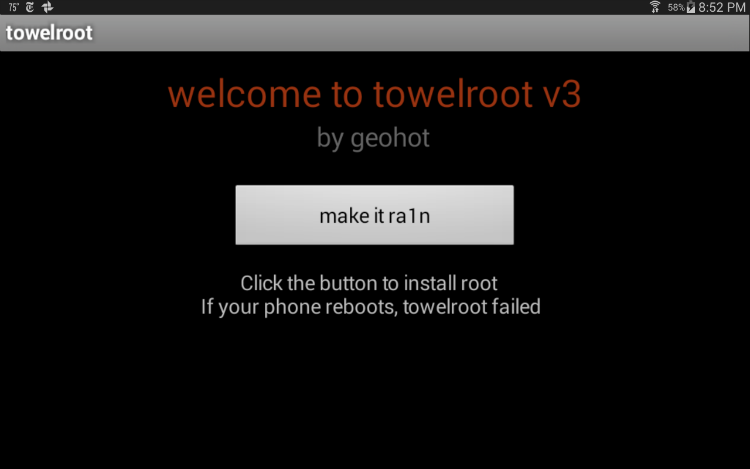 Towelroot is a newly introduced Android app to make it incredibly easy to root your Android device. Unlike all other methods of rooting in which you connect your device to a computer and flash the root to the phone or tablet, Towelroot roots your device right from the app with one-click. A quick note if you are not sure what rooting your phone does you want to read this article before you root your Android device. Unknown Sources must be turn on for you to install third-party apps on your Android Device. You will receive a warning message stating Google does not recommend installing the app. This is due to the fact that the app roots the phone which can be a security risk. If you are comfortable with this check the box that you understand and hit install anyway. Click make it ra1n and the app will root your Android device. That’s It your Android device will be rooted or if it failed to root the app did nothing and you will have to resort to the old way of rooting your phone. Once you have rooted your Android device you need to install an app to control which apps can use root access. You want to install SuperSu by Chainfire which manages root access for you and will improve the security of your rooted phone. If you do not have a specific app in mind to use to test whether you have root access on your Android Device or not, you can install an app from the Play Store that does exactly that. To verify your Android device has indeed been rooted you can install the app Root Checker from the Play Store. All this app does is tries to get root access and verify if your Android device has been rooted. If the app worked after following these steps your Android device is rooted and ready for you to use it to its fullest. Hopefully Towelroot worked for you as it did for me. It is a great app and a big improvement in Android development. I hope this article was helpful in rooting your Android device with Towelroot. Let me know what your experiences are when rooting your Android devices and if you have had any problems with Towelroot.